Yesterday I posted a review video of the Kobo Aura One, and after watching it for myself I realized that it didn't adequately convey just how poorly the Aura One handled PDFs. And so I made my own. I tested my Aura One loaner with a 58MB Doctor Who comic. It's not a large file, no, but I found that the Aura One handled a 6MB PDF and a 600MB PDF just as poorly. The tl;dr version is that the storage limitations (8GB internal, and no card slot) won't bother anyone because the Aura One is simply unusable for PDFs. When you watch the video, count the seconds it takes to open a PDF (8 seconds). Then count the seconds required to turn the page (4+ seconds). Also, late in the video note how it only partially loads a page (the footer is shown, but not the page image). What's not shown in the video (I couldn't duplicate what I saw in an early test) is that the Aura One is even slower at redrawing a zoomed in page than it is at turning the page. If you picture the screen divided into a grid 12 panels, the Aura One was refreshing the page one panel at a time. Do you want to know where Kobo screwed up? It would be easy to blame the CPU, and RAM, but the real problem is the software. Kobo choose a screen no other device maker could match, then gave the Aura One a one of a kind frontlight - and then crippled the ereader with the same awful software running on previous models. As much as I love reading ebooks on Kobo hardware (the formatting options are to die for) I don't use them for PDFs, and never have. The software is simply terrible, and that is true across the board. Before publishing this post I confirmed that my Aura HD has similar poor performance in the PDF dept, thus depriving us of even the hope that the first official firmware for the Aura One could improve the situation. And that is unfortunate for Aura One owners, because PDFs are one of the main use cases to justify the Aura One's 300 PPI 7.8" screen. Nate – did you try to install KOReader? If so, did it improve performance? Thanks. So, Kobo spent the last 8 months not improving their firmware? I you are serious about PDFs, then there’s only one real choice right now unfortunately: the Sony Digital Paper. Just curious. Did you try with a text PDF? I know it may sound silly but from what I remember (my aura is dead), Kobo has that performance issue with images in general (I think it acted like that with CBZs). But I can’t remember if it acted like that with text PDFs (And not PDFs which are images of text). Though even if there’s an improvement it would still be a severely limited use. For the record, I have a few older game manuals (primarily text, some graphics) snd loaded them onto the One last night. They work quite decently on it, as do even some RPG sourcebooks. As long as they don’t have complex formatting, they work ok. Even if it was responsive at displaying pdfs it still would not be a suitable device for reading pdfs… because it is too small. You need at least 10 in, preferably 13 in. Else you will be constantly resizing or squinting. That’s where the Sony and (maybe) the Pocketbook viewers come in. People keep forgetting PDF was designed as an electronic *paper* archival format. Decades spent trying to turn it into a consumer ebook format still haven’t changed that. Your viewer still needs to be a close approximation in size as the target print output device. Which for most of the academic pdfs is A4 or thereabouts. The next most popular target size is manga and 8″ is just about perfect. But it still requires good rendering software. It’s too small for any meaningful PDF reading anyway. 7.8″ is not that much bigger than 6.8″ or even 6″. It’s still primarily an ebook reader and that’s what it’s marketed as. If you want to read PDFs, get a 13″ ereader or an iPad. 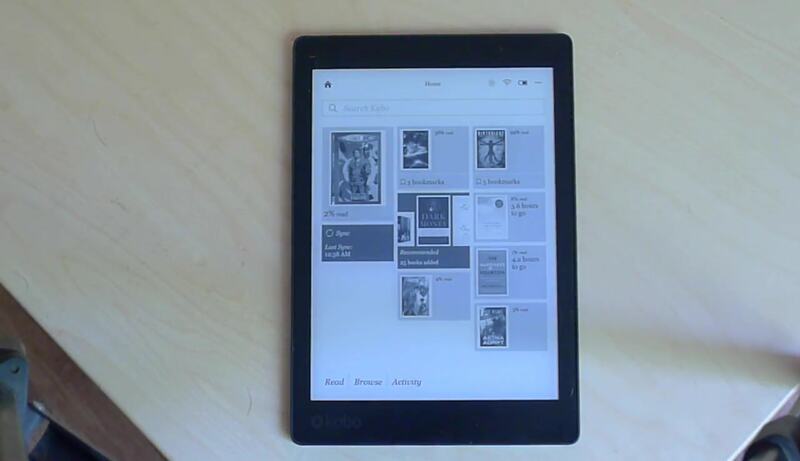 Anything smaller than that is just as unusable for PDFs as the Kobo Aura One is. What happens if you convert your pdf into one in black&white or grayscale (4 colours)? I think that trouble conserns colourful page’s rendering. I think you’re really exaggerating. Yes, it might be slow with some scanned comic books in PDF format, but not everybody reads scanned books all the time. I have a few scanned books that load a bit slowly, but turning pages is ok. I have many PDF books that contain both text and illustrations, and I enjoy reading them on the One. The relatively large high resolution screen makes me never use the (useless, frankly speaking) zooming functionality anymore. Just make sure you enable the FullScreenReading setting. It enables you to get rid of the waste of space on the screen due to margins. Reading PDFs 1:1 on the display of the One is perfect for me. The Aura One has more problems than just that: battery discharging over night, touch issues (phantom touch, displaced touch, touch not recognized), backlight issues (green/orange patches). After exchanging and the second unit being even worse, I returned for refund. There is ZERO quality control for hardware and software (firmware update to fix battery delayed). And they sell this #### at a premium. This was my last Kobo. A popular program for optimizing PDF files for smaller display e-books like Kobo is k2pdfopt. Free and open source, so nothing to lose but time to try it.